One can see why, according to Rotten Tomatoes, critics like this movie way more than the general public does. With few lines and just one unnamed character, it’s perhaps an allegory of humanity’s urge to survive, or hold on to life. It could be about “everyman,” although in this instance it’s about one fairly well-to-do white man (Robert Redford), probably American, judging from his accent at the beginning of the movie. We never get to know his name, nationality, or his back story. In the beginning he’s writing a farewell note declaring his sorrow about his failings and how he wished he’d been. But who hasn’t wished they had been kinder? We quickly flash back a week to observe how he got himself into a mortal struggle. 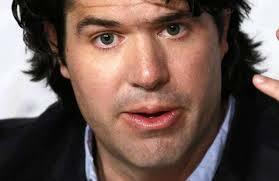 This is director J. C. Chandor’s second major feature. The first, his magnificent Margin Call, received many awards and two Oscar nominations (Best Writing, Best Original Screenplay) last year. His switch from a dialogue-heavy film to one with almost none is impressive. He is someone to watch. One’s thoughts do wander while watching this film (I checked my watch at least four times) but it’s always interesting to see what our guy is going to do next. His boat has been damaged by a huge cargo container in the middle of the Indian Ocean and he embarks upon various ways to try to save it. It’s the kind of movie in which many people can’t resist whispering to each other “what’s he doing?” With patience, we see. I’m eager to find out from sailors whether he does the logical things. But it’s not all restore and repair since storms blowing through interfere with his work, leading him to seek alternative solutions to various dilemmas. 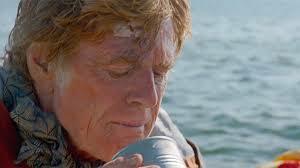 Redford is so magnificent in this role that it’s almost impossible to imagine any other actor doing it. It would have been enormously easy to emote too much or too little. Everything depends upon his facial expressions and his actions. He never gets out of character and we have every opportunity to watch for a slip. He is serious and determined, unsentimental in the extreme, and of course increasingly aware of the possibility of dying very soon. He doesn’t show fear or fall apart but neither is he without signs of feeling. Several possible chances to achieve salvation slip by and at these moments we feel empathy for this man about whom we know barely anything. We respond to his drinking just enough water to sustain himself. Redford is sure to get an Oscar nod for this amazing performance. One significant and refreshing point is that this character is old although Redford’s hair is likely dyed to make him look a few years younger. Huffing and puffing accompany the many acts of exertion he undertakes. Redford, who in fact is 77 years old and has done nothing to erase his wrinkles, is excellent in evoking our compassion in this regard. We wonder whether our guy will die simply because he cannot keep up the strength to do things that would help him. It’s good to see a male character who is simply his age, rather than unbelievably fit or unfit. The cinematography, directed by Frank G. DeMarco (Margin Call) with Peter Zuccarini doing the underwater shots, is smashing, rivaled only by Life of Pi, with which Zuccarini was involved. Film editor Pete Beaudreau also did an excellent job, refraining from too many or too few artful shots. Much of the time we see what our guy sees. But then we see down upon the craft in the midst of a vast ocean. And up, viewing the life raft from leagues below. From the depths the raft looks like an amoeba, perhaps suggesting the smallness of people in midst of the natural world. This movie is not for everyone and certainly not for those who are looking for a lot of action. Most “one character lost and in trouble” movies, which seem to be gaining in number on the American scene, have more hooks. 27 Hours has flashbacks and dreams. Gravity has the beauty of the universe, although compared with All is Lost the action in Gravity is a lot less interesting with its sophomoric dialogue. In Cast Away, Tom Hanks is communicative and emotive, which certainly works. Life of Pi has an entire back story and all kinds of magic, not to mention a tiger. Chandor is going with something far more minimalist here. He even beats out The Artist, a silent film that is OK but nothing spectacular. Perhaps it’s because one can project oneself into All is Lost if one has a certain kind of patience.